Described by critics as a "trad music supergroup", ZoDoMo is the latest highly acclaimed traditional Irish group to step into the limelight. The trio features three of Ireland's eminent musicians, Zoë Conway, one of the country's most gifted virtuoso musicians who is equally at home in both traditional Irish and classical styles. 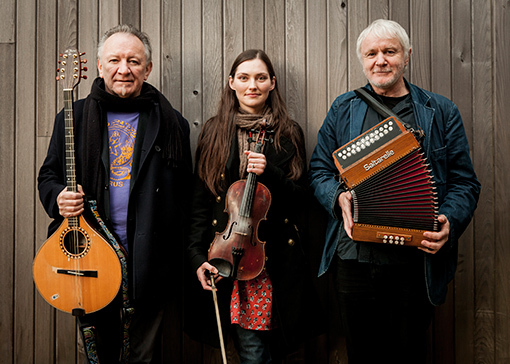 Dónal Lunny, popularly regarded as having been central to the renaissance of Irish music over the last three decades and Máirtín O'Connor, a master musician whose dexterity and innovation has won him worldwide acclaim. A gifted guitar and bouzouki player, composer and producer, Dónal Lunny is a figurehead of Irish traditional music and a household name in the Celtic music scene. He has been at the forefront of the evolution of Irish traditional music for more than 35 years and is popularly regarded as having spearheaded its renaissance over the last three decades. Since the seventies, Dónal has founded legendary seminal Irish bands, Planxty, The Bothy Band, Moving Hearts, Coolfin and more recently Mozaik, Triad, Usher's Island and Atlantic Arc Orchestra. Much sought-after in studio, he has produced albums for artists such as Kate Bush, Baaba Maal, Paul Brady, Indigo Girls and Clannad. Regarded in the folk firmament as something of a national treasure, Máirtín O'Connor's name has been synonymous with the accordion for decades both as a master of the instrument and as a composer/arranger. His skill, dexterity and innovation has won him acclaim around the world both as a driving force behind the Riverdance phenomenon, as a member of De Dannan, and for more than a decade as the Máirtín O'Connor Band with Cathal Hayden and Seamie O'Dowd. Máirtín has composed for theatre, television and film and has been a session and guest musician on many recordings by international artists such as Rod Stewart, Elvis Costello and Mark Knopfler. Máirtín O'Connor Band performed at the Copenhagen Koncerthuset for WOMEX '11.